How about an afternoon of pints and pups? 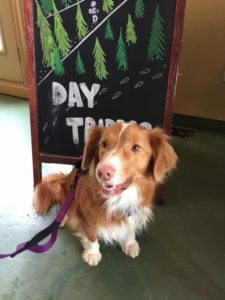 The craft beer craze has taken Ontario by storm and in many instances we have found they often welcome well-behaved dogs, which means you can incorporate your canine friends in a tour of local breweries. We first encountered this last spring on a trip to investigate Second Wedge Brewing Co. in Uxbridge, Ont. We had our newest Toller, Autumn in tow and were pleasantly surprised when they welcomed her inside. Second Wedge, like several breweries in the Greater Toronto Area, also has their own housedog Sadie. 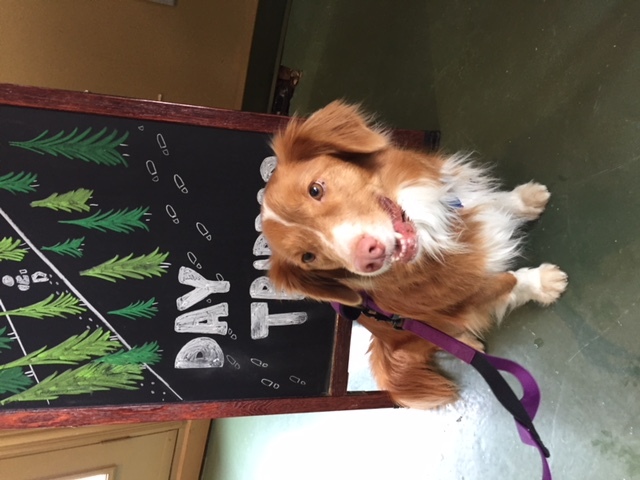 Autumn came into Second Wedge Brewery with us to check out the brewery and enjoy a pint of Day Tripper. Uxbridge is home to hundreds of kilometers of trails — part of the Durham Regional Forest Trail system. It has in fact been designated The Trail Capital of Canada, so you could begin your day with a hike nearby and finish with a cold pint at Second Wedge which has a wonderful outdoor patio area in addition to indoor seating. 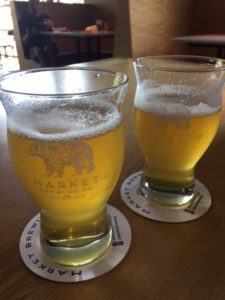 Of special note is Market Brewing in Newmarket, Ont, a brewery that has put “Yappy Hour” on the calendar for several dates in 2018 including June 14, July 19, August 16, October 18 and December 13 from 4 to 8 p.m. Each Yappy Hour benefits a different charity and is hosted by a community organization in the brewery’s taproom. Market Brewing has green space behind its industrial location on Leslie Street so there is a good spot to air your dog if she needs to take a walk. You can also bring the kids and enjoy board games available onsite. Many craft breweries also offer some kind of snack onsite. 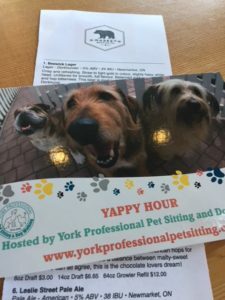 Drop by Market Brewing on June 14 for Yappy Hour! We have also observed dogs hanging out with their people at Old Flame Brewing in Port Perry located in that town’s downtown core. There is good parking nearby. On July 15th Old Flame and Second Wedge are teaming up for the 3rd Annual Pooch & a Pint from 12 to 4 p.m.. Show your support for a new animal for shelter for Uxbridge-Scugog. Receive a 12-ounce beer for a minimum donation of $10. As well on July 15 the Uxbridge Farmers’ Market is celebrating the Year of the Dog. Sawdust City Brewery in Gravenhurst also welcomes dogs into their tasting space. Most craft breweries offer some kind of snack. 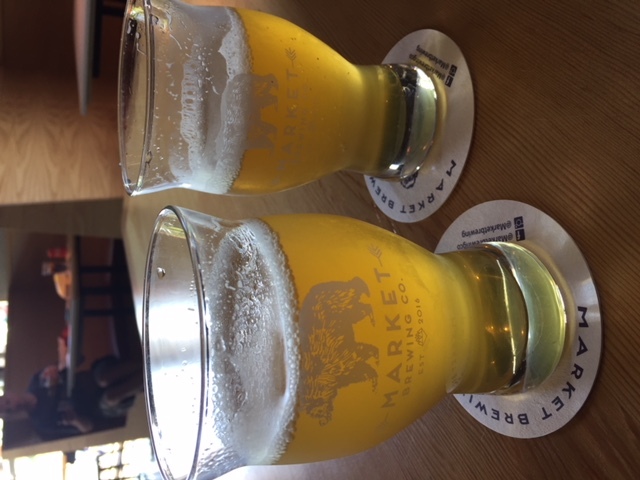 Market Brewing in Newmarket, Ont. 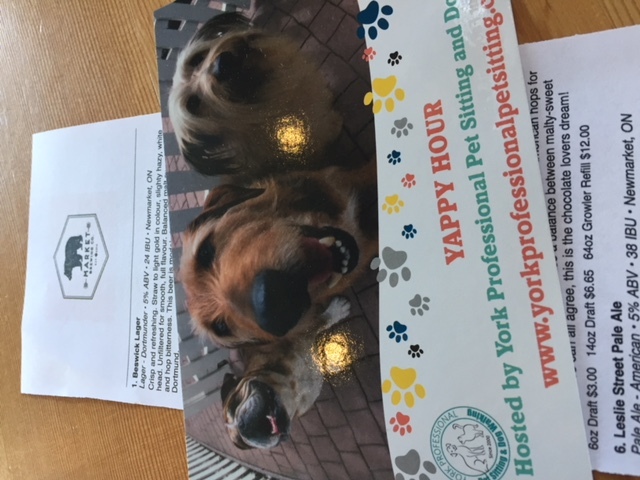 hosts a ‘Yappy Hour’ once a month, inviting patrons to bring their dog to the brewery. In Toronto’s east end, Left Field Brewery features Wrigley the Basset Hound as the head pooch in charge of customer relations.